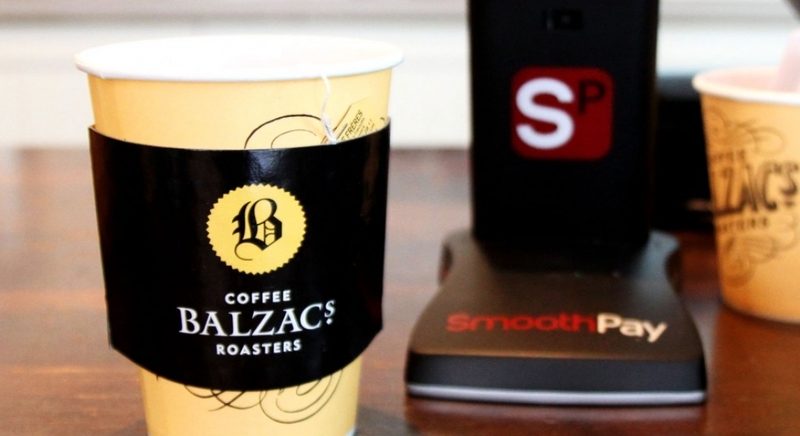 TORONTO (March 2, 2015) —Balzac’s Coffee Roasters announced the launch of their mobile app featuring mobile payment and a loyalty program available for iPhone and Android smartphones. “We are excited to be providing our customers with a more convenient payment method than ever before, combining payment and loyalty into a single smartphone app transaction” says Balzac’s owner Diana Olsen. The Balzac’s app, powered by SmoothPay, is simple to use and eliminates the need use cash, or dig for loyalty or debit/credit cards to swipe. “This app will reduce lineups, and provide a more seamless interaction with our customers which in turn allows us to focus our efforts on the product and preparation” says Olsen. The sign-up process is easy and fast, customers can check their loyalty rewards earned in real-time, and credits are deducted automatically at the time of payment. Other programs in the market do not work on all smartphones and require prepaid cards which can slow the transaction process down. “Balzac’s is a multi-faceted coffee company that roasts our own coffee, operates cafés across Ontario and has a retail component. Our business has had tremendous growth despite being in a highly competitive space alongside global corporate brands. Our customers are smartphone users and looking for an alternative to cash and plastic cards. We looked at many options,” said director of operations Balzac’s Coffee Roasters Steve Janzen. “Balzac’s is a well run company with great product and beautiful locations. We are proud to be launching their app on our mobile payment, loyalty and customer engagement platform. All their locations are also listed in the SmoothPay app for our customer base. Working with strong brands like Balzac’s Coffee Roasters is key to our strategy as we expand across Canada,” said CEO and founder Brian Deck. To download the Balzac’s and SmoothPay apps go to Apple’s App Store or Google Play Store. Balzac’s values are infused with everything our customers experience in our cafés. Artisanal, Sustainable, Local and Natural are the four cornerstones of our business practices. Each product is thoughtfully and diligently sourced. While we endeavour to keep an eye on efficiency and affordability, we will not take shortcuts with our quality or preparation techniques. We strive to offer ‘Slow Food’ prepared quickly, not ‘Fast Food’. Balzac’s has been offering Fair Trade Organic coffee, sugar and cocoa since 1997 and all milk used in our beverage service is organic and locally sourced. SmoothPay is a mobile payment platform that combines payment, offers, loyalty and customer engagement in a single smartphone app transaction. SmoothPay is available for free download on both iPhone and android devices. Customers use SmoothPay “in-store” by presenting the pay screen to a small-sleek terminal operated by the participating businesses. The technology operates through a unique QR code that securely identifies the payment details.